I have been building things for years. I have found, when starting out, it is best to copy someone else’s design. So with that in mind, I am going to describe my show electronics for this year as one reference point. There probably should be a forum thread for this with multiple examples. 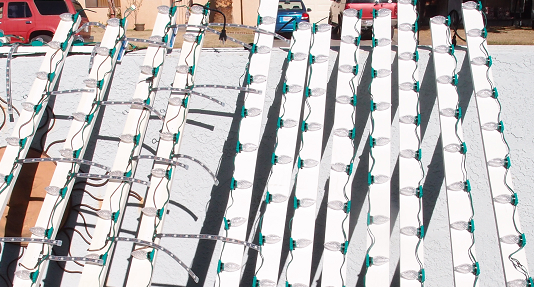 This year I have about 1500 LED lights along with 1000 LED lights in the matrix sign. I bought a computer in 2013, just for running my show. It is basically a home built PC running windows 7-64-bit. The only suggestion I would make for the computer is to use a solid state hard drive or a flash drive. This will help minimize the delay for running the show, and would be my first computer upgrade. My show computer is at the back of the house, so I ran about 130 feet of Ethernet cable to my controller in the front yard. This is shown in the picture below. Yeah, it isn’t perfect, I had to take the screen off and tape the joint. Good thing I live in a warm climate. 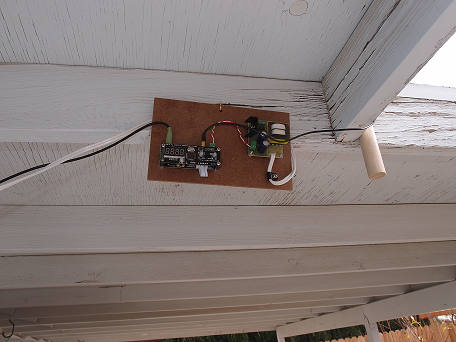 I tried to run my FM02 in my study, but I was not getting enough range, so the FM02 is in the back patio under the eves. I have a picture of the cables out the window (cables), and the FM02 hanging under the eves. I am using the stock antenna and it is on top of the dowel to the right of the FM02. With this setup I achieved the normal one to two block range. I have a small courtyard at my front door, and just inside on a small table. On the table I have my pixel controller and a Ethernet switch. My computer is plugged into the Switch along with my main controller and the controller for a small matrix LED sign. The output to all of the lights is as RS-485 running out on about ten Ethernet cables. 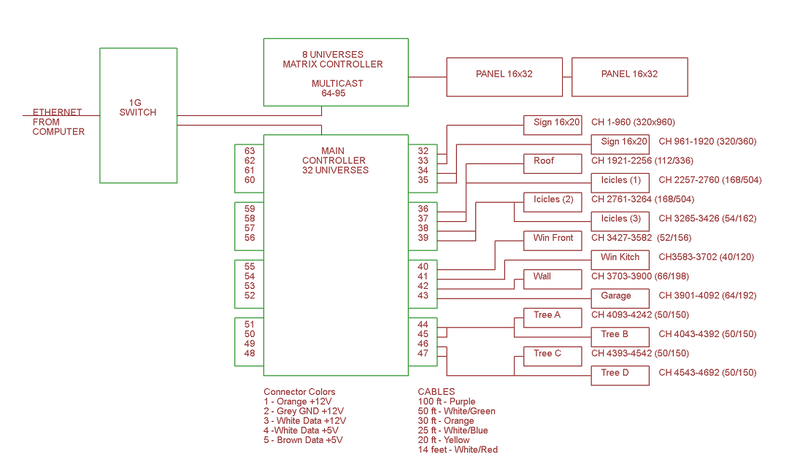 The wiring diagram shows the layout. At each set of lights I have a RS-485 receiver board. The board support either one or two outputs. These are the shallow blue electrical boxes. I have wired power into some of the boxes, and other just have controller output signals (RX_boxes). The ones with no power are powered from the lights. I have hard soldered waterproof connectors into the boxes as the output. I live in the desert, so I wasn’t too concerned about water. However, we received over an inch of rain and the boxes did not leak. Most of my lights are on sticks, with the waterproof connectors between them, as shown below. 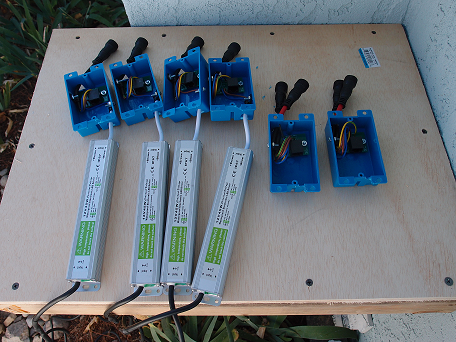 So the blue boxes with power are to drive the lights on my front wall, two windows and around the garage. The two boxes without power are to drive my four mini trees out front. The last seven sticks long my eves, have both the C9 bulbs and icicle strips. 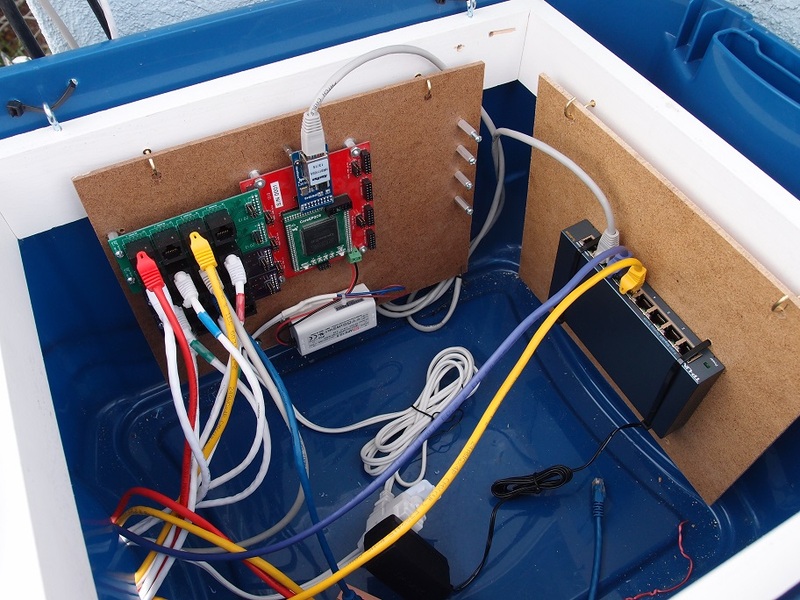 The power supplies for this are on the back of the boards along with standard AC outlets for the power. So I basically ran power along my eves. I am using Xlights/Nutcracker to sequence the lights. 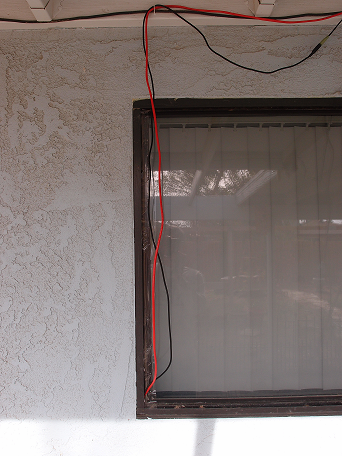 Which I did poorly in the week I had left after completing all of my new wiring. Xlights allows you to set the intensity of each of the display elements to achieve similar brightness. I used it to reduce my average power draw, by setting all of the display elements at 2/3 brightness and the display at 1/3 brightness so it does not overwhelm the show lights. The end result was an average power draw of 2 amps with 4.5 amps peak @ 115VAC. My family likes to drive around and look at lights. We don’t tend to spend more than a few minutes at each of the houses. With this in mind, I trim most of the songs to 2 minutes or less. This keeps the show short. I still do not have a good way of taking videos, dusk seems to work better.